In order to understand the state of contemporary architecture, it must be understood that the profession has for decades now been characterized by a philosophical schism between contemporary traditional architecture and contemporary Modernist architecture. 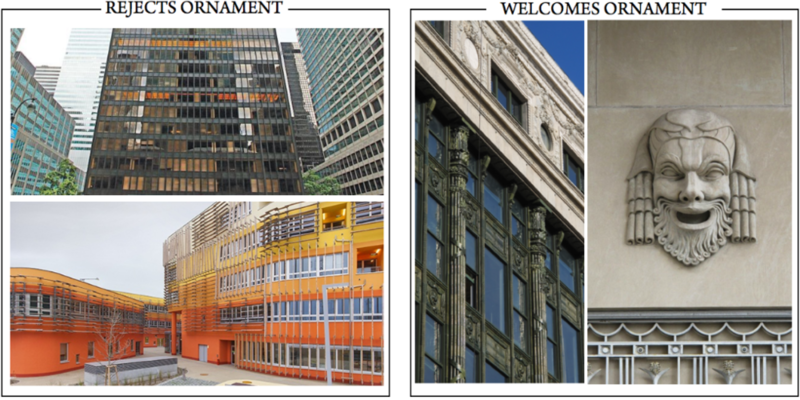 Before the advent of Modernism, there was no such thing as "traditional" architecture; there was just "architecture." Up until the advent of Modernism, architecture had always included those things that Modernism promised: innovation, adaptability, functionality. It had also included things that Modernism did not promise: beauty, balance, harmony. We were promised that by the avant-guard's purposeful rejection of tradition, our communities would be the benefactors of a great flowering of artistic genius. Instead, what we have seen over the last century is the greatest waste of resources our planet has ever seen. Modernism is not a style. Modernism is a philosophy, or at its minimum, a philosophical stance. It defines itself as the rejection of tradition. As wikipedia says, "Modernism is the rejection of the ... rationality, harmony, and coherence of Enlightenment thinking, art, and music.” In fact, before it was called "Modernism," it was called, "Anti-traditionalism." Modernism is not a stylistic advancement of building traditions, but a philosophical rejection of them. Today's Neo-modernists often won't call themselves that - they'll say that Modernism died in the 60's and that we've moved on to an age of "pluralism." Yet, of the 130 schools of architecture in America, at least 127 of them teach NO Traditional architecture. So today's "pluralism" really means: you can do anything that you want - so long as it isn't traditional. 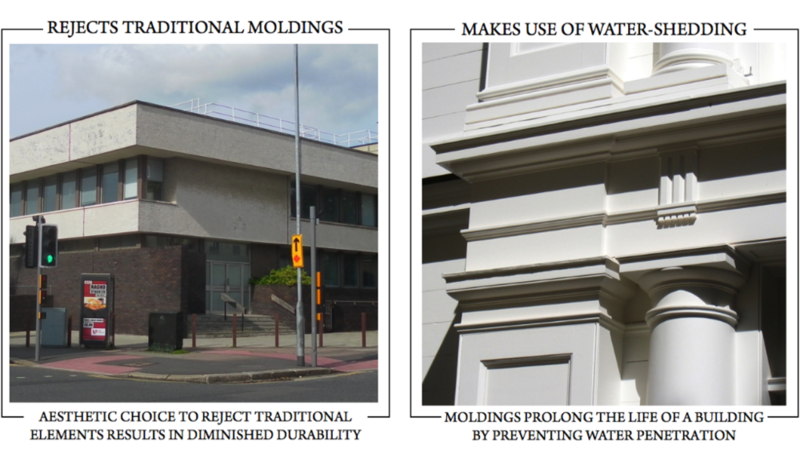 Contemporary Modernist buildings continue to fail (both aesthetically and environmentally) because their designers continue to reject those architectural elements, means, and methods that have proven successful for thousands of years, as well as those developed to deal with unique environmental conditions. To find a more sustainable architecture we cannot continue the same failed philosophies that have gotten us here in the first place. We need to open ourselves up to all possible technologies, including those from the past. 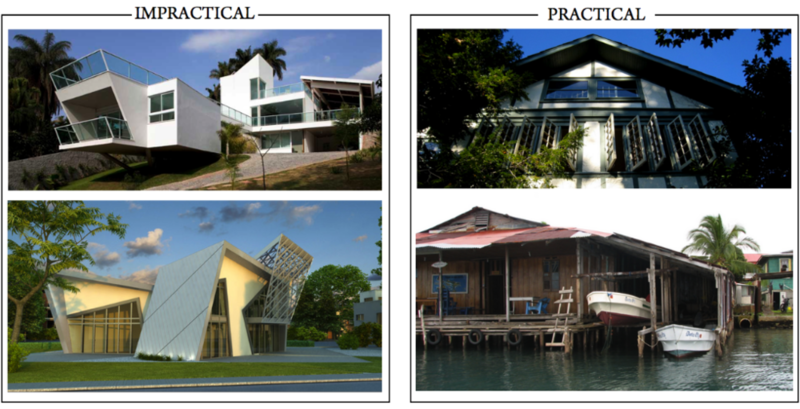 For more information please see the Architecture section of our Recommended Readings page.